As technology advances, more and more industries begin looking for ways to integrate hybrid or fully electrical motors into their vehicles. While we have seen most carmakers announce many EVs for the next few years, Zunum Aero seems to be the first company that moves towards fully electric flight. Backed by Boeing’s HorizonX and Jet Blue’s Technology ventures, the company has recently revealed detailed information about the first vehicle that it plans to use. The new aircraft has been developed with regional service in mind, being able to accommodate 12 passengers. The delivery window for the Zunum vehicle starts in 2022. This change could have a major impact on the industry, as the operating expenses of the airplane are around $260. Furthermore, it has a maximum cruise speed of 340 mph, a take-off distance of 2,200 feet, and comes with a hybrid engine that offers a range of 700 miles. In terms of pollution, the model has an 80% lower noise and emissions output, than normal regional planes. The CEO plans to maximize the operating efficiency of over 5,000 U.S. airports which are currently operating under capacity. In order to do this, the Zunum airframe has been designed to work with the runways and airports that are already in place, and the charging and fueling systems required for the new vehicles can be installed without having to make drastic changes to the buildings. The company has also released information according to which the aircraft has been designed to be adaptable in terms of power sources. In essence, the fuel tanks can be reduced in size and be replaced by additional batteries, in order to transform the vehicle into a fully electric one. Kumar also said that the new airplanes could reduce travel times, as well as the cost of a journey. According to him, the price for a ticket would be a third less than the current commercial pricing. The shorter travel times do not necessarily refer to the time spent in the air, as a big factor of how long an airplane journey takes is the congestion at various airports. The company intends to provide flights near to where consumers are living, and, through this, to redistribute regional flights away from international facilities. 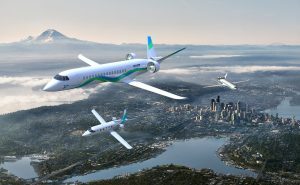 Zunum Aero plans to organize flight tests in 2019. These will take place at a new development center near Chicago which is planned to open in the near future.